Each June the staff of Go Shuck An Oyster.com participates in The Todd J. Schwartz Softball Classic, a fundraiser for the Jimmy Fund. This event honors the life of Todd J. Schwartz (TJS), a vibrant college student and Dana-Farber patient who died of cancer in 2002 at the age of 19. This all-day event incorporates a softball tournament and countless activities for individuals, families and children, as well as a large silent auction and barbecue. For more information see For Todd. Since 2003, this event has raised more than $250,000 for the Jimmy Fund's Family Festival, an annual event for Jimmy Fund Clinic patients and their families. 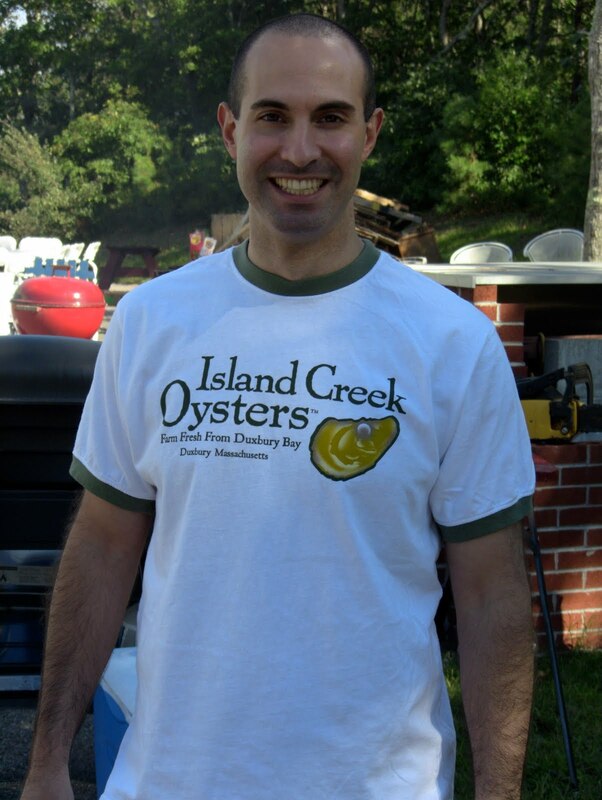 This past June, after I got in touch with Erin of Shucked, Island Creek Oysters donated an oyster gift package that included 3 dozen Island Creek oysters, a knife and a t-shirt. Todd Lieberman was the highest bidder during the TJS silent auction, and was the winner of the oyster gift package. Overall, the event raised over $31,000 this year. On Friday, June 10th, Todd L. picked up his oyster package in Duxbury, MA. He told me things were busy at Island Creek headquarters as they were getting ready for the Island Creek Oyster Festival (held on September 11, 2010) but that didn't stop them from taking time to prepare his oyster gift package. Go Shuck An Oyster.com and the planning committee for the TJS event thank Island Creek Oysters for the generous gift. It is also fitting that this post is written today as many family members and friends of Todd J. Schwartz walked 26.2 miles today during the Boston Marathon Jimmy Fund Walk to raise money in his name. If you'd like to donate to the team, click here. As of this post, the team has raised $25,881.75.